It doesn’t matter if your sourcing equipment for a complete fleet of trucks or only one unit; we treat all of our customers equally. When partnering up with suppliers we only work with companies who offer forklift extensions Canada based business can trust and rely on. This has always been our philosophy and it is one constant that will not change. We know that quality and safety are important aspects for you and you can rest assured that they are our top priority as well. If you purchase a set of fork truck fork extensions from us you also have the option of having our experience staff conduct forklift training for your team to ensure that they are well trained and know how to operate the machine with the new addition. Lift truck fork extensions and specially manufactured attachments are a great way to increase the productivity levels in your facility, save your employees a lot of time, improve the overall operations of your plant, and make some tasks safer for all personnel. When you and your company are ready to invest into improving the efficiency of your company’s material handling process be sure to remember Source Industrial Services. 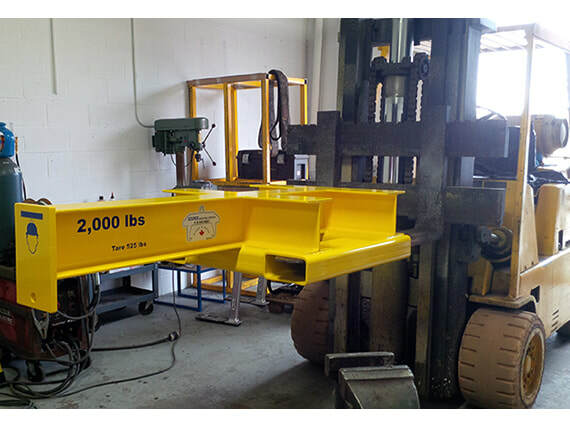 We are your one stop shop for standard extensions, heavy duty equipment, or custom fabricated add ons and our team is always happy to assist new customers with all of their specific needs and requirements. We can even help if you have a requirement for a complete fall protection system for your building.